Note: The Department of Veterans Affairs (VA) has implemented its new policy for VA Pension benefits, effective October 18, 2018. More information is available in our announcement linked here. The below article is maintained for historical purposes only. On January 23, 2015, the Department of Veterans Affairs (hereinafter “VA”) issued proposed changes to the regulations affecting VA Pension eligibility, a needs-based program. In support of the proposed changes to the regulations, the VA points to the results of a 2012 Government Accountability Offices (GAO) report. That report recommended changes in order to “maintain the integrity of VA’s needs-based benefit programs.” The proposed changes come on the heels of two bills: H.R. 2189 proposed by the House of Representatives; and S.944 proposed by the Senate. Both bills were proposed in 2013 and no action has occurred with regard to them since late that same year. The VA’s proposed changes are strikingly similar to the two proposed bills, which Congress failed to pass. VA Pension benefits are a major focus of the proposed changes. These benefits are available to wartime Veterans (and their surviving spouses) who meet certain criteria. Prior to September 1980, the Veteran must have served at least ninety (90) days of active duty with at least one day being during a wartime period (as set by Congress). After 1980, the Veteran must have generally served at least twenty-four (24) months of active duty with at least one day being during a wartime period. The Veteran must not have been dishonorably discharged. There is a disability requirement for the VA Pension benefit, which is satisfied if the Veteran is sixty-five (65) years of age or older, or permanently and totally disabled. If the Veteran or surviving spouse has additional medical needs then additional allowances may be awarded, like an aid and attendance allowance. An applicant for VA Pension must also meet certain financial requirements. The current law reads that an applicant’s net worth must not be excessive, taking into consideration the applicant’s age, income and expenses, life expectancy, and rate of depletion of the applicant’s net worth . The financial rules also require that household income must be less than the benefit the applicant is seeking; however, income may be reduced by out-of-pocket medical expenses. The proposed changes include a bright-line limit on “net worth” that an applicant is allowed to have when qualifying for VA Pension. The limit is the same as the maximum community spouse resource allowance (CSRA) for Medicaid purposes (currently $119,220). This amount would increase annually at the same rate as the cost-of-living increase for Social Security benefits. Income is also counted toward the net worth limit under the proposed rules. The proposed rules would include income in the applicant’s net worth calculation. In other words, if a Veteran has assets worth $117,000 and receives an income of $2,000 per month, the Veteran’s “net worth” is calculated at $117,000 + $24,000, which is well over the “net worth” limit allowed. A primary residence, whether or not the claimant resides there, is an excluded asset for calculating “net worth” and will continue to be so under the proposed regulations. However, the proposed rules cap the “reasonable lot area” that the home sits on at 2 acres, a limit that does not exist under current law. The proposed regulations include the addition of penalty periods for assets that an individual transfers prior to applying for VA Pension. Any “covered assets” (one that is used in calculating “net worth”) that are transferred will be subject to a penalty period. The penalty provisions are not limited to actual gifts, but also apply to the purchase of an annuity or a transfer to a trust (revocable or irrevocable). The actual penalty period (the time period that the claimant will remain ineligible for the Pension benefit due to the transfer) may not be longer than ten (10) years. The penalty period will be calculated by using the amount of the transfer over and above the “net worth” limit and dividing it by the maximum annual Pension rate. This penalty period begins to run the month after the last transfer was made. To illustrate: A married Veteran applies for VA Pension with an aid and attendance allowance. The monthly benefit she is trying to qualify for is $2,120. During the past 3 years, the Veteran contributed $10,000 to The Wounded Warriors Project, a nonprofit organization. She also gave her only child $1,000 on each birthday the past 3 years. As a result of the charitable contribution and the cash gifts to her child ($13,000 total in 3 years), this Veteran will be penalized for 6.13 months when she applies for VA Pension. If this same Veteran was not married, the penalty would be 11.3 months. The lookback period for all transfers, is thirty-six (36) months immediately preceding the date of application for the VA Pension benefit? There is a presumption that any transfer made during this thirty-six (36) month period of time was made for the purpose of qualifying for the VA Pension benefit. As an exception to this presumption, the claimant must prove by clear and convincing evidence that the transfer was the result of fraud, misrepresentation or other bad act in the marketing or sale of a financial product. Otherwise, the presumption is non-rebuttable. In the example above, the Veteran, whose transfers had nothing to do with VA Pension eligibility, would not be able to rebut this presumption and would have to take the penalty imposed. Medical expenses are those that are either medically necessary or improve a disabled individual’s functioning. These medical expenses are deducted from income. This becomes more complicated when the claimant is receiving home care or is in an independent or assisted living facility, as the proposed rules seek to limit the circumstances under which room and board expenses may be counted, as well as the amount paid. There are very specific rules as to which services qualify as medical expenses and the claimant will have to be able to identify those in his/her application. The proposed rules also limit the hourly amount that can be paid to a home health care provider. The amount is based on a national average, rather than local costs for care. The surviving spouse of a wartime Veteran can make a claim for the Pension benefit if the Veteran meets the service criteria and the spouse meets the financial requirements. However, the proposed rules put the surviving spouses at a disadvantage. The proposed regulations allow surviving spouses little flexibility in planning due to the calculation method of the penalty period. Where a married Veteran applying for VA Pension with an aid and attendance allowance could transfer $10,000 and incur a penalty period of 4.7 months, a surviving spouse transferring the same amount would incur a penalty period of 8.7 months. As illustrated earlier, the gifting that many people do to benefit their children on birthdays, holidays or other reasons, charitable contributions or donations to places of worship will create a penalty period under these rules. Below are just a few of the potential negative effects of the proposed regulations if they pass as currently written. We would be happy to speak to you further about additional harmful effects of the rules as written. 1. As mentioned above, surviving spouses will be penalized more harshly than Veterans for making transfers prior to applying for VA Pension – even if those transfers had nothing to do with qualifying for VA Pension. 2. Applicants in rural areas will be treated unfairly by the 2-acre limit on the reasonable lot area. Currently, an applicant’s home and reasonable lot area that is immediately adjacent to the home is not counted for net worth purposes. 3. Transfers made prior to an application for VA Pension will be penalized regardless of the reason for the transfer. Therefore, a cash birthday gift to a child, a contribution to a charity, or a donation to a place of worship will all be penalized if the Veteran or surviving spouse later applies for VA Pension. 4. Basic estate planning, like establishing and funding a revocable living trust, will be subject to a penalty if that same individual applies for VA Pension within 3 years. For a more detailed analysis of the potential negative effects of the proposed regulations, the National Academy of Elder Law Attorneys (“NAELA”) has submitted a 27-page commentary on the rule proposal. The regulations proposed by the VA are currently up for public comment until March 24, 2015. Until that deadline, the public is free to comment and the VA is required to respond to those comments before passing the regulations. You may also consider reaching out to your local representatives in Congress to let them know about some of the negative effects of the proposed changes. 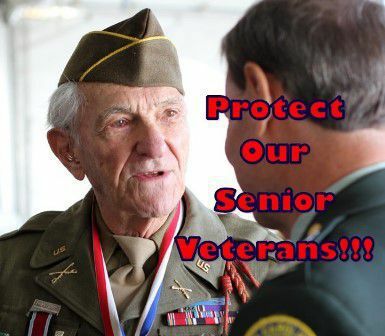 I am a citizen in your district who is concerned about a proposed rule that the VA released on January 23, 2015 that would severely restrict Veterans Aid & Attendance benefits. Those benefits are intended to help Veterans who need support paying for the high-costs of long-term care due to a medical condition. If you would like more information or would like to discuss the impact of these changes on wartime Veterans and surviving spouses in more detail, please feel free to contact our office. The proposed change would amend 38 CFR Part 3, which covers net worth, asset transfers and income exclusions for needs-based benefits.